BBQ season is almost here, and we can’t think of a better way to celebrate outdoors than some quality backyard putting time with friends and family. 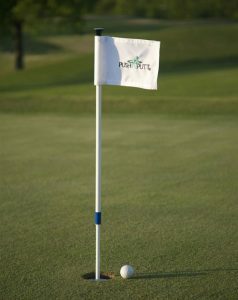 Showcase your personality by adding one of PushNPutt’s backyard golf flags to your course! With a variety of colors, patterns, and options to choose from, you can’t go wrong with PushNPutt. When you think of traditional flagsticks and turf products, you likely haven’t come across anything quite like PushNPutt’s innovative tools. Our flagsticks are interactive, durable, and feature a patented design that significantly lessens the strain on your back and knees by removing the constant need to bend over to retrieve your golf balls from the holes. Our colorful backyard golf flags allow you to put your creativity on full display, whether you’re selecting from our stock or designing your own personalized flag. We’ve got you covered either way. If you think that having personalized backyard golf flags sounds great, then we’ve got even better news for you—our merchandise is made to last. PushNPutt’s products are crafted with high quality, premium materials that are manufactured right here in the USA. All materials have been tested to withstand all sorts of weather, so you can count on your flagsticks and accompanying backyard golf flags to look great for years to come. Don’t delay in getting your locally assembled, high quality flagsticks and backyard golf flags today! You can browse our selection online to check out an assortment of models, as well as decide which flags will represent you the best out on the turf. Don’t forget that we can customize your flags, so bring your imagination to the table and let us bring your personalized embroideries to life! If you have any questions, do not hesitate to call today at 828-464-8882 or send us an email at info@pushnputt.com. Our team looks forward to serving you!